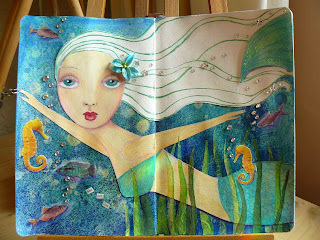 Finished my first Suzi Blu mermaid painting in my art journal a couple of days ago. I had so much fun making this!! It is not difficult at all to make. Just make a background in the art journal with alohol inks and spray paint. Add water and dab with a tissue, add alcohol drops and dab again. Add some drops of bleech and let it rest for a while. Draw a mermaid on another page of the art journal and take that page out of the journal. Cut out the mermaid, color and paint it. Put some green seaweed made of thin paper on the bottom of the left and right page. Glue down the mermaid and add some more seaweed on top of her. 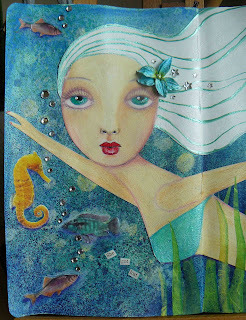 Add some fish and seahorses and glue down some small crystals as air bubbles. Put a flower in the hair of the mermaid and also some crystal stars. I made green pearly lines in her hair with 3D fabric paint from Tulip. The title of my page is: She got lost. It's about losing your own spirit growing up. You can loose your own true self in so many ways and get lost. But can you see that my mermaid is swimming out of the seaweed? Soon she'll be in the open water and free to move around as she pleases! That's where I'm heading too! !